KABUL - A former Islamist warlord who brought al Qaeda's leading figures to Afghanistan registered Thursday to run in the country's presidential elections, backed by major power brokers and the chairmen of both chambers of the Afghan parliament. Abdul Rasoul Sayyaf—the most conservative, and most controversial, among Afghanistan's presidential hopefuls—is seen as a credible contender for the job, in part because of his Islamic credentials and his past as a leading mujahedeen commander with high name recognition. His registration ceremony at the country's Independent Election Commission turned into a show of force, as several dozen trucks and sport-utility vehicles packed with gun-toting militiamen and bedecked with giant Afghan flags trailed the politician through the streets of Kabul. As Mr. Sayyaf, an Egyptian-trained cleric with a long white beard who espouses the ultra-rigid Salafi interpretation of Islam, presented his documents, hundreds of backers erupted in loud chants of "Long live Islam" and "Long live jihad." "We will clean the dust off the face of the people, and wipe the tears of the orphans of this country," he told the crowd. "The first step that we need is national unity." President Hamid Karzai, who in the past suggested Mr. Sayyaf may be a feasible candidate but hasn't endorsed any presidential hopeful, is barred by the constitution from contesting the April elections. Continued international aid—without which Afghanistan's security forces and economy would collapse—hinges on conducting an election that is considered legitimate. A botched vote could push the country into civil war as U.S. forces withdraw and the Taliban insurgency remains resilient. 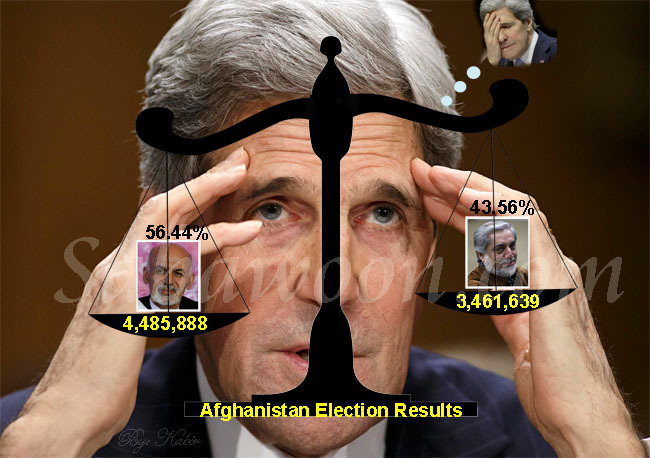 Stephen Biddle, a professor at George Washington University who advised the Pentagon on Afghanistan, cautioned that a victory by Mr. Sayyaf in the April election could prompt a massive cut in U.S. assistance, with potentially catastrophic consequences. "For many members of Congress, I suspect this would be the last straw," he said. "Election of a figure who would be seen by many U.S. lawmakers as anti-American would make it hard to sustain a majority in favor of substantial aid." Many Islamist radicals, including Osama bin Laden, came in the 1980s and 1990s to training camps run by Mr. Sayyaf's Saudi-backed movement that were initially set up for anti-Soviet mujahedeen fighters, according to witnesses and the U.S. government's 9/11 commission report. The report describes Mr. Sayyaf as a "mentor" of Khalid Sheikh Mohammed, the mastermind of the Sept. 11, 2001, attacks. An entire terrorist movement in the Philippines, Abu Sayyaf, is named after him. However, Mr. Sayyaf was an enemy of the Taliban and sided with the U.S. after the 2001 invasion. Born in 1946, he served as a member of the Afghan parliament until resigning this week. He also remained loyal to Mr. Karzai, often using his command of Arabic and of Islamic law to dispute the Taliban's claims of representing genuine Islamic resistance. Speaking in English to Al Jazeera and The Wall Street Journal after his registration on Thursday, Mr. Sayyaf declined to say whether he would back a continued U.S. military presence after the coalition's current mandate expires at the end of next year. "They are already here," he said when asked about U.S. troops in Afghanistan. "In any decision, in any discussion we will take care of the priorities of our nation. This is what we want to do." He said, however, that he seeks better ties with the U.S. and allies, as well as Afghanistan's neighbors. "Those countries who have helped us in this crucial point of our history, we will strengthen our relations with them," Mr. Sayyaf said, adding he expects international aid to continue flowing should he gain power. Seeking to soften his conservative image, Mr. Sayyaf also said he backed women's rights—though the giant entourage trailing him to the election commission was exclusively male. "We did not bring them with us because it is crowded and the trouble of the way," he explained. "I hope a big number of supporters of us will be women, because they know we will keep their rights and their safety." A Pashtun from the Kabul province, Mr. Sayyaf selected Tajik strongman Ismail Khan, the former "emir" of western Afghanistan who served until now as the minister of water and power in Mr. Karzai's administration, as his first vice president, if elected. "We believe in our victory. The Afghan people recognize us because we protected Afghanistan during jihad," Mr. Khan told the Journal. Mr. Sayyaf's second vice-presidential nominee is Abdul Wahab Erfan, a member of the ethnic Uzbek minority—a slot that went to an ethnic Hazara in the Karzai administration. The Uzbek and Hazara communities each account for about 10% of the country's population. Many Hazaras are wary of Mr. Sayyaf because of his record fighting Hazaras during the 1990s civil war, when much of Kabul was reduced to rubble by warring militias. An aide to the politician, lawmaker Mohammed Daud Kalakani, said the Sayyaf team also includes Hazara members but preferred to choose an Uzbek running mate because the Uzbeks are also seeking to be involved in Afghanistan's future. Mr. Erfan's nomination, however, doesn't mean the endorsement of the powerful former Uzbek warlord Abdul Rashid Dostum, who controls much of the ethnic Uzbek electorate. "He is an independent candidate. Our coalition is still in negotiations" about which candidate to support, said Faizullah Zaki, the deputy head of Mr. Dostum's party. People familiar with these negotiations say Mr. Dostum is likely to back former Finance Minister Ashraf Ghani, who resigned as Mr. Karzai's transition adviser this week but has yet to file his nomination papers. With three days to go before Sunday's registration deadline, only two major politicians have registered to run for the presidency—Mr. Sayyaf and former foreign minister Abdullah Abdullah, who came in second in the 2009 elections. While Mr. Abdullah showed up at the election commission wearing a Western suit, Mr. Sayyaf came in a traditional Pashtun turban and coat. In addition to Mr. Ghani, other candidates expected to register in coming days include Mr. Karzai's brother Qayum, Foreign Minister Zalmai Rassoul, former Defense Minister Abdul Rahim Wardak, and Gul Agha Shirzai, former Nangarhar provincial governor. —Ehsanullah Amiri contributed to this article.